Do you want to publish your research sooner? Dr. George Espie from the University of Toronto reveals how OpenSPR helped him accelerate his research and publish within 3 months.The research paper “The structure, kinetics and interactions of the β-carboxysomal β-carbonic anhydrase, CcaA” published in Biochemical Journal uses surface plasmon resonance data generated with OpenSPR to study the crystal structure, kinetics and protein-protein interactions of the β-carboxysomal β-carbonic anhydrase, CcaA. The authors of this paper include Leah McGurn, Sean White and Matthew Kimber from the University of Guelph as well as Maryam Moazami-Goudarzi, Tannu Suwal, Beant Brar, Jason Tang and George Espie from the University of Toronto. We had the chance to interview Maryam Moazami-Goudarzi, a graduate student of Dr. Espie, to learn more about this discovery-based research and how it will allow an in-depth mechanistic understanding of fundamental life processes in cyanobacteria. 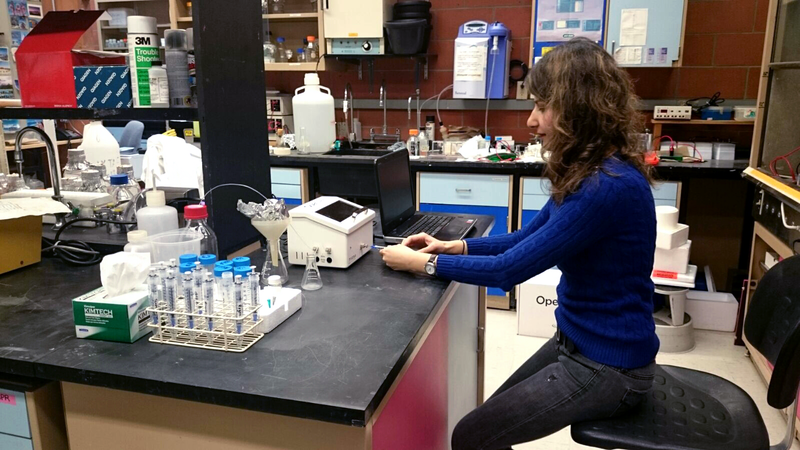 Graduate student Maryam Moazami-Goudarzi using Nicoya’s benchtop OpenSPR (previous model). Tell us about your recent publication in Biochemical Journal that uses OpenSPR. Cyanobacteria are a large and diverse group of photosynthetic bacteria that are contributors to primary productivity on a global scale. Part of their success is due to a unique evolutionary adaptation called the CO2 concentrating mechanism that enhances oxygenic photosynthetic efficiency. This is achieved by packaging the Calvin cycle enzyme Rubisco and carbonic anhydrase within carboxysomes, proteinaceous microcompartments where the substrate CO2 is concentrated. A key mechanistic feature of the carboxysome is the spatial organization of the protein components. In this article we described the crystal structure, kinetics and protein-protein interactions of the β-carboxysomal β-carbonic anhydrase, CcaA. CcaA was found to have a unique hexameric, trimer-of-dimers organization, not previously observed in any other organism. Localized surface plasmon resonance measurements indicated that CcaA interacts with CcmM, a catalytically inactive, trimeric, β-carbonic anhydrase that is located at the inner surface of the carboxysome shell. Based on the three-fold axis of symmetry the CcaA hexamer would have two CcmM binding sites located on opposite surfaces, resulting in a CcmM3CcaA6CcmM3 complex. The catalytic activity and kinetic parameters of the enzyme showed it to have relatively low activity compared to other experimentally examined β-CAs. In fact, the C-terminal portion of the CcaA protein appears to partially inhibit CcaA activity, possibly as a mechanism to tune CO2 production with CO2 consumption by Rubisco. What was SPR used for in this research paper? In this study we used SPR to quantitatively examine the CcmM-CcaA interaction. The unique C-terminal domain of CcaA contains an approximately 80 amino acid extension with only the first and last 15-20 amino acids showing significant conservation. In order to determine the role of the C-terminal tail of CcaA we investigated the binding kinetics of full length CcaA274 and the truncated CcaA220 to CcmM206. We also studied binding to a CcmM206 variant (CcmM204-4A) that had four amino acid substitutions that was designed to test the site of CcmM-CcaA interaction. How was the SPR data critical for getting this research published? SPR has allowed us to experimentally quantify the CcmM-CcaA interaction, and without it we would rely on qualitative data using pull-down assays. It also enabled us to determine the kinetic parameters of the interaction and investigate the role of the C-terminal tail of CcaA and the site of the CcmM-CcaA interaction. SPR provided the simplest, most direct and quantitative method to determine the interaction kinetics of our proteins of interest. Would you recommend OpenSPR to other scientists? Yes, because it provides you with a cost-effective method to obtain large amounts of accurate data using small amounts of sample. OpenSPR is a user-friendly and low maintenance benchtop SPR solution backed by hundreds of researchers. With access to SPR technology on your own lab bench you can get the high quality data you need to accelerate your research and publish faster.